Despite his gruesome and untimely death, Georgie was critical to the eventual defeat of It. Georgie was the first victim of Pennywise the Dancing Clown but he is also the reason why his brother, Bill, finds the courage to finish him off. Georgie is a cute young boy who is mostly remembered because of his yellow, hooded raincoat. He is also usually depicted holding a red balloon from Pennywise. 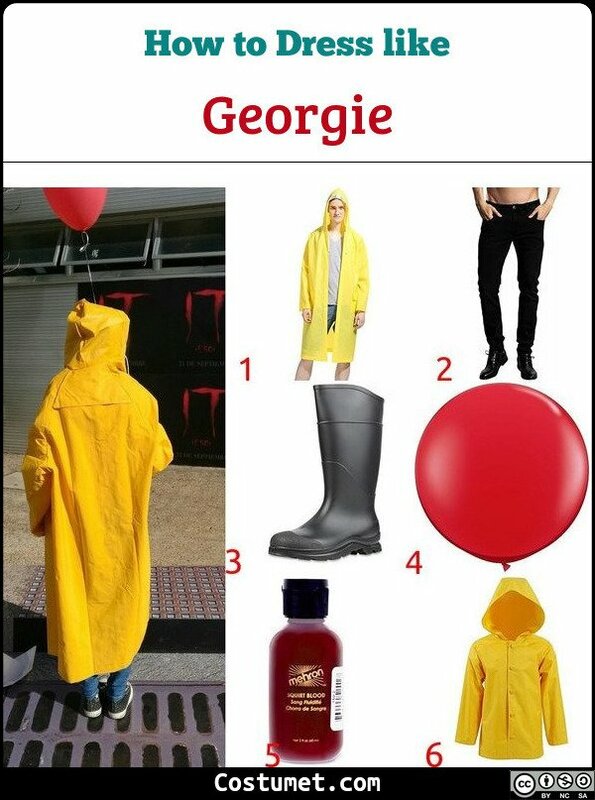 Here’s everything you need to look like Georgie from It. 1 Yellow Hooded Raincoat Georgie is most known for his bright yellow, hooded raincoat. 2 Black Pants Pair your bright raincoat with simple, black pants. 3 Black Boots A pair of black, rubber boots are great for rainy days. 4 Red Balloon Georgie can sometimes be seen holding a red balloon from Pennywise. 5 Fake Blood Use fake blood to show how gruesome Georgie’s death actually was. 6 Yellow Hooded Raincoat for Kids Your little kid can become Georgie with this yellow raincoat for kids. 7 Full Costume Set For a quick and easy change, use this costume set. Georgie Denbrough was played by Jackson Robert Scott for the 2017 remake of It. There were so many nice outfits that Eddie wore that it can be a bit hard to pick just one. Wear a pink polo shirt, red running shorts, red sneakers, a fanny pack, an arm cast, and red balloons. In the movie, Draco Malfoy doesn’t have a problem wearing muggle clothes and looks very dashing in his all black ensemble.